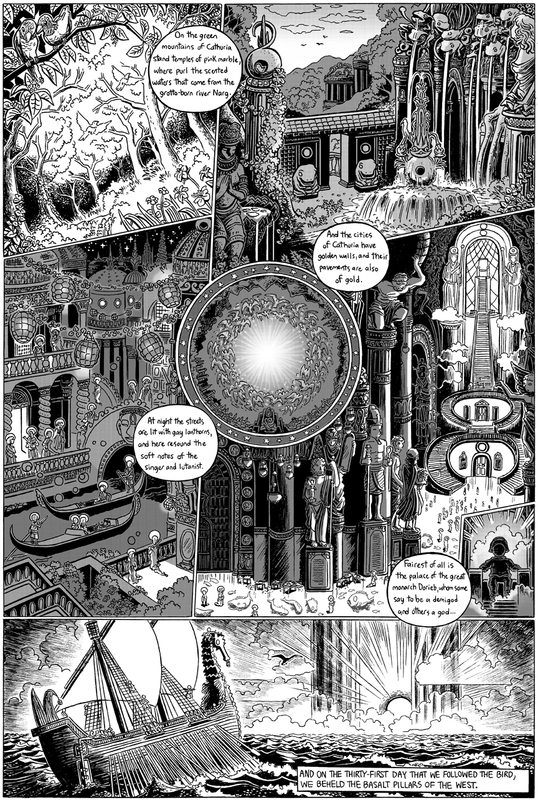 On this page I used a lot of screentone, which I normally use in imitation of the way it’s used in manga (although my own use is nowhere near as pervasive or as subtle). For many years I bought screentone from art supply stores, and when I went to Japan in 2001 I bought a ton of it to bring back. But by the time of “The White Ship” I broke down and just did all the aftereffects in Photoshop, which is a zillion times easier. The only real-life screentone which had been enduringly useful to me are the funky patterned ones like they use in shojo manga, with all the sparkly lights and so on (although that’s not appropriate for “The White Ship”, of course….). I have scanned a bunch of those and use them periodically. Victor Hao, my friend and the artist of King of RPGs, uses a program called “Manga Studio” which has really incredible screentone capabilities, but I haven’t used it yet. Emphasis on the “yet”! This image brings me back almost 10 years to when I first read the Book of Lost Tales by JRR Tolkien. It had an image of a ship travelling through a pair of pillars, with the sun. I agree… these comics bring back the wonder of childhood.